Over 40% of Canadians suffer from sleep disorders and high stress levels. A recent Harvard study concluded that by practicing just 30—45 minutes of yoga a day, people fell asleep 30% faster and reduced their nighttime waking by 35%. Restorative yoga is one style of yoga that helps you relax and let go of the daily stresses. Here is one yoga pose that may help you to sleep and relax: Supta Baddha Konasana (Reclined Bound Angle). Start kneeling on your mat. To support sensitive ankles, place a blanket on top of your mat. Place one bolsters vertically on the top end of your mat. Add a folded blanket on top that will support your head (centerline of your chin should stay slightly below the centerline of your forehead). Keep 2 bricks close. Recline back onto the bolster, keep it close to your lumbar spine and keep your buttocks grounded on the floor. Bring the soles of your feet together and allow the knees to split out, grab the bricks nearby to slide them underneath the outside of your thighs for support. Optional, feel free to support the arms as well, another pillow or rolled up blanket will bring release. Eye bag for your eyes will regulate the pressure in your head. Hold for 5 minutes. To release the pose inhale the knees up and let them fall together with your feet mat width apart (tenting your legs). Rest for a moment to adjust and breathe. When you feel ready, roll sideways off the bolster into a fetal position, head resting on the bottom arm. Stay for a few breaths again to give the nervous system time to adjust. Once in the posture, check in with the length of the inhalation, natural rhythm of the breath. Then, without a lot of effort, allow the length of the exhalation to be 2 counts longer than the inhalation. Sense how the body is being moved by the breath. Stimulates Parasympathetic Nervous System (rest and digest); calms anxiety; calms a scattered mind; soothes and comforts; reduces stress; relaxation response; promotes the feeling of releasing emotions (chest and pelvis are our emotional centres); supports digestion; gently opens the front side of the body, pelvis, belly, shoulders, throat and chest. Avoid this pose if you suffer from a shoulder or hip injury. 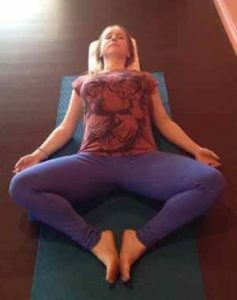 If you have a groin or knee injury you should perform this pose with a yoga blanket placed under your outer thigh to provide support. You should also avoid this pose postpartum. Refrain from practicing this pose till the pelvic area muscles, which get loose after child birth, come back to their pre-pregnancy tightness. 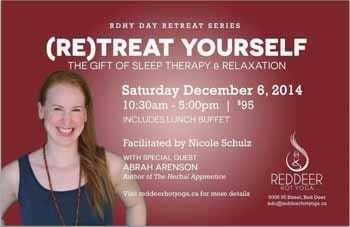 Nicole Schulz is leading a OneDay Retreat on Sleep and Deep Relaxation on Saturday, December 6th at Red Deer Hot Yoga. Students will look at the definition of sleep and the types, conditions and causes of sleep disorders. You will learn how yoga can be a powerful tool to improve your sleep and well-being and help you find deep relaxation! This retreat will focus on customized specific physical postures (asanas), relaxing breath work (pranayama), mind calming practices (iRest® Integrative Restoration Yoga Nidra) and dietary recommendations. There will be a wonderful guest speaker: Abrah Arenson, author of the recently published book “The Herbal Apprentice” will share her knowledge about herbs that help to induce sleep and deep relaxation. Bring your beautiful self, eye bag and your own pillow. For rates, registration & questions please check www.nicole-yoga.com!